A team of 10 volunteers from the Office Friendly cooperative took part in a 6 mile fundraising walkathon to support two amazing charities in Sheffield. The first stop along the route was with the green-fingered founders of The Well Community Allotment Group. This amazing project was set up just 2 years ago by brothers, Rob and Tchad Western, to help young people connect with nature by seeing sustainable agriculture in action. Office Friendly’s second destination was at the City of Sanctuary, a support centre which helps change the lives of destitute asylum seekers. 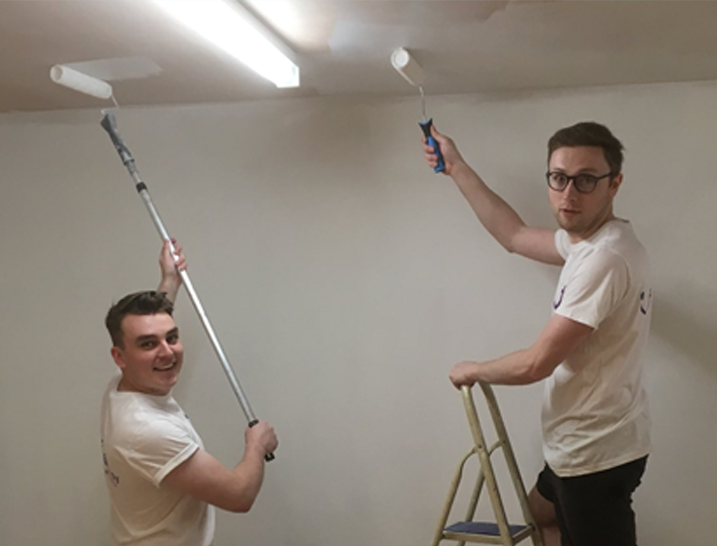 Here the team helped to renovate the building with a fresh lick of paint, before returning to their base to complete the 6 mile hike. The initiative, which was supported by partners, South Yorkshire Community Foundation (SYCF), doubled up as a fundraiser. The walkathon was generously supported by Office Friendly’s socially-charged community, and funds raised will go back into the local community to help young people in need. “It’s amazing to see the group, our members, and the wider community come together to support such worthy causes,” said Adam Anson, chief organiser and Marketing Manager at Office Friendly. And what a start it’s been. Earlier this year, the Office Friendly Community Foundation donated a significant amount of clothes to Sheena Amos and The Suit Works, enacted separate cycling and running fundraisers, hosted a blind auction for charity and even ran an Easter raffle. To find out more about Office Friendly’s Community Foundation and how you can join their vibrant programme of social responsibility, visit https://www.officefriendly.co.uk/community/.